The chief executive of Corus, the Anglo-Dutch subsidiary of Indian steel giant Tata, has asked UK Prime Minister Gordon Brown for government aid. Corus head Philippe Varin said state help was needed to allow firms to avoid redundancies amid falling output. The scheme could be similar to the plan recently introduced in the Netherlands to pay up to 70% of workers' basic pay to allow retraining and paid down-time. Corus has already axed 500 jobs from its UK workforce of 25,000 last month. 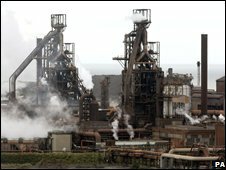 The firm, which was bought by Tata Steel for $12bn (£8.1bn) in 2007, plans to reduce its European output by 30% by March. "We are looking for the [UK] government to take swift and decisive action to mitigate the effects of the financial crisis on manufacturing industry," the company was quoted as saying by the Financial Times newspaper. Mr Varin was among business representatives at a European Business Summit in London on Monday, attended by leaders of Britain, France and the European Commission. Corus has three main UK plants at Port Talbot, Scunthorpe and Teesside.